As part of our full services offered at Stillwaters for your improved health and well-being, you may be offered a prescription for Chinese herbs. This idea was ‘new’ to many of our patients. To help put you at ease, the 2,000+ year old herbal tradition in China is valued scientifically. In fact, many modern drugs have been developed from herbs. For example, “Wu Wei Zi” (schizandra root) and “Gan Cao” (licorice root) are used in modern day hepatitis remedies. Other Chinese herbs you may have familiarity with are “Ren Shen” and the American version “Xi Yang Shen” commonly called “Ginseng”. Both herbs help to increase energy in the body and protect the delicate balance between “Water and Fire / Yin and Yang” according to Traditional Chinese Medicine (TCM). In Western herbal tradition, they are called “adaptogens” for their ability to nourish the body in cases of both excess and deficiency. In recent years, we’ve seen the rising popularity of green tea with its potent antioxidant properties and the use of ginkgo bilobae, “Bai Guo”, for Alzheimer’s and general mental acuity. Both these herbs have their roots in TCM. Over 300 different herbs are commonly used today. In reality, there are over 3,000 herbs, hundreds of mineral extracts and some animal extracts that complete the list. With thousands of years experience, their clinical applications are more sharply defined as to what ailments they can help relieve and how to achieve a proper balance for your body. Why take Chinese Herbal Medicines? 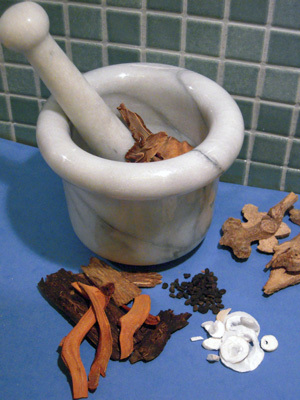 Constance Fraatz is National Board certified in Chinese Herbal Medicine. She is one of a limited number of physicians that create customized herbal formulations. These customized formulations are generally more effective because they are unique to each person’s pattern of disease. The main purpose of taking the herbal teas or pills is to restore a balance in your body. They are also used to help prevent certain conditions and/or alleviate various conditions. Often Western medicine focuses on specific symptoms rather than addressing a total wellness problem. Chinese Herbal Medicine, on the other hand, treats the imbalances in your body which are the root cause of your symptoms. Herbal medicines are usually prescribed for short periods of time and can be discontinued when your body’s harmony and balance have been restored. What conditions can be treated with Chinese Herbal Medicines? Gastric Disturbances: Acid Reflux, Crohn’s Disease, IBS, etc. And many more conditions, both acute and chronic. Do Western medicines and Chinese Herbal Medicines ‘mix’? There are very few interactions or counter indications between Chinese Herbs and Western pharmaceutical drugs. Chinese Herbal Medicines are primarily plant based and natural, yet there is always a possibility that either prescription can affect the other. For example, you should not take St. John’s Wort if you are taking an anti-depressant medicine. Be sure to talk with your regular doctor as well as your Oriental Medical Physician who is a highly trained National Board certified Herbalogist. Tell them both what prescriptions/herbs you are currently taking or are about to take. Are Chinese Herbal Medicines in pill form? When you receive an herbal prescription, it usually takes the form of tea or drops. Just add warm/hot water and drink completely. However, some patients prefer the ease of taking pills and for that reason, all prescriptions are available in capsule form. Chinese Medicinals are extremely well tolerated. Side effects are rare. Your Oriental Medical Physician is trained extensively in the use of these valuable herbals and can answer any questions you may have at the time of your visit.